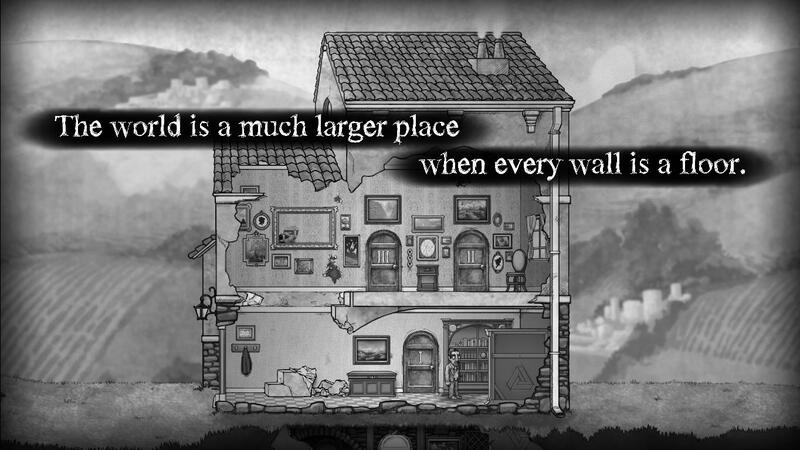 Despite the relative brevity of the game, which only lasted about five hours for the first play through, when I finished The Bridge, a 2D puzzler inspired in equal parts by M.C. Escher and Isaac Newton, I took more away from the experience than I have with any other game in recent memory. I've been playing videogames for decades, from Dune II and Betrayal at Krondor in the early 90's to Far Cry 3 and DMC: Devil May Cry most recently. I've committed weeks of my life to certain games on many occasions, and while I rarely regret the time I spend in game, I do often feel as though I've not gotten much return on my investment. Admittedly, I take away a lot of good memories, often some sort of social interaction, and possibly even a small bonus to my DEX, but I rarely see a shift in my perspective as a result of playing a game. I admit that I'm something of a tough nut to crack in this regard - even the most woeful of literary tragedies can't squeeze a single tear out of me - so when anything does truly impact me, be it a game, a movie, or a piece of literature, it's definitely noteworthy. No, The Bridge didn't make me cry, but that's not what it was going for. What it did was change how I look at a small part of the world, namely the works of my favorite artist, M.C. Escher. 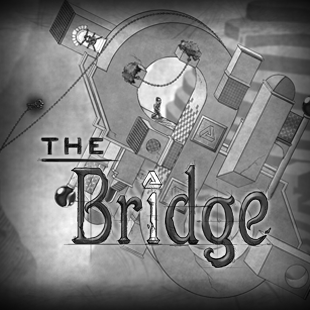 The Bridge is an amazing experience, from the Newton-esque apple dropping on the head of the largely silent protagonist, to the baffling stages that took me ages to beat, even when I cheated and used the hints. It's not about fast-paced action sequences or high-resolution textures; the game is a generally dawdling experience, with a sketchbook feel to the art. It's all about experiencing the impossible architecture of my favorite artist in new and unique ways. For the Escher connoisseurs out there, you probably recognize The Bridge as one of his more mundane works, where stairs actually take you up and down, rather than both at once. Though I'm confident that its mundanity is a matter of relativity, as it compares to some of my favorite works. 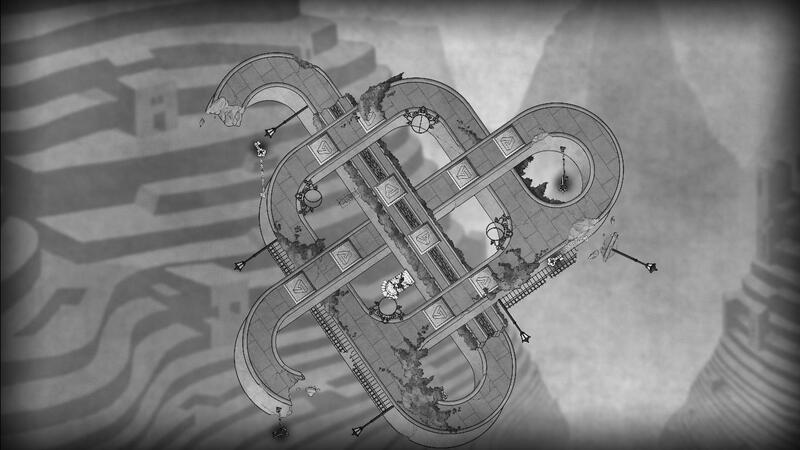 What I love most about Escher's more whimsical works is the setting-specific logic that shapes the world. In the case of Relativity he does this with multiple gravity perspectives, making it sensible enough when you consider that gravity is affecting the world differently in different locations, but at a glance it seems to be utter chaos. The Bridge fits this bill exquisitely, being at once baffling and sensible, where you can puzzle out your path or get lost in the architecture, depending on your mood, moves, and direction sense. 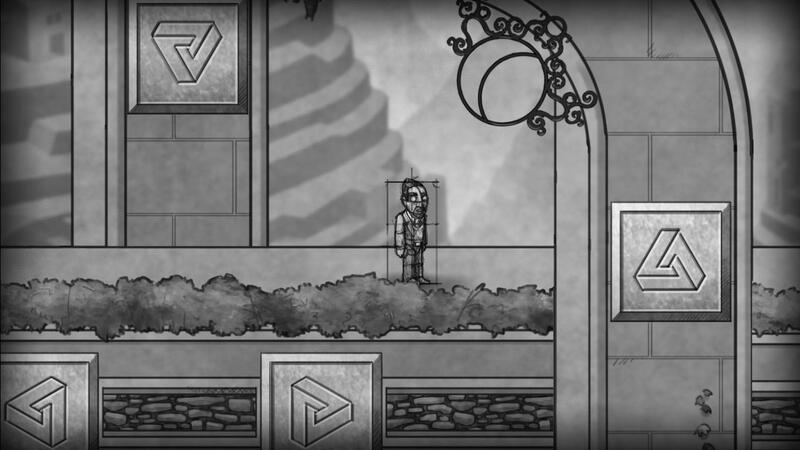 When I launched the game for the first time, I was treated to a black and white scene, with the main protagonist being a tiny little sketch of a man, searching his way through a world he couldn't possibly comprehend. I played it for hours, absorbing the minutiae of every stage of every chapter. There is nothing in The Bridge to distract you from the dizzying visuals and unique gameplay. By using only four buttons for the primary controls, the designers eliminated the need for coordination. You'll never find yourself trying to make a difficult jump - you can't jump at all in The Bridge - and you don't have to remember any button combinations. You can move left and right, and you can rotate the world around you. That is the entirety of the game. Each chapter introduces a new mechanic, something akin to the multiple gravity perspectives in Relativity, requiring you to observe the world from a wholly new perspective with each passing stage. 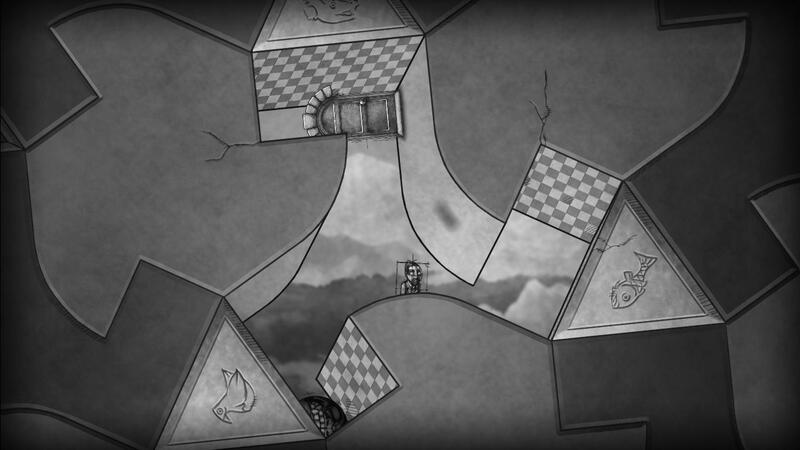 The Bridge exercises your mind, forcing you to shift perspectives time and again throughout the game. Just as repetitive physical exercises train your muscles to certain motions, The Bridge trains your mind to consider the possibility that a new outlook will help make sense of the senseless. 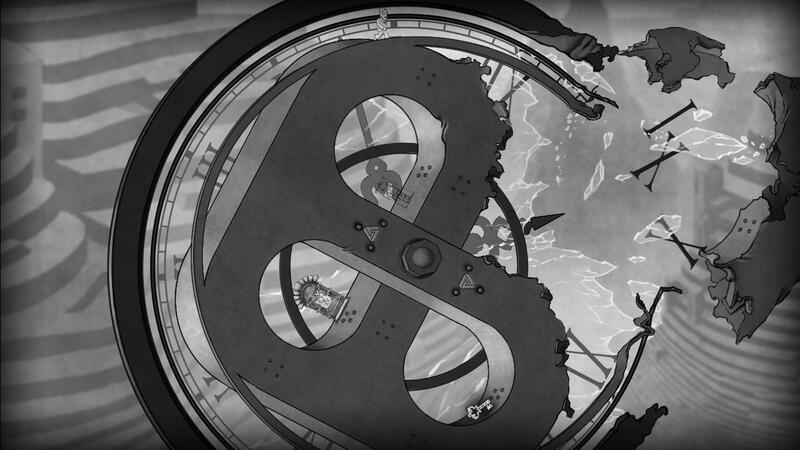 In the first stages of The Bridge, you'll learn to rotate the world around you, but in the background, you'll be learning to rotate your view without having to actually do so in game. This kind of training opens up new worlds when it comes to appreciating some of Escher's more bewildering pieces. Take House of Stairs, for example, and you'll see what I mean. Ignoring the six-legged monstrosities crawling around, if you try to approach the scene head-on, it's a dizzying array of staircases, going in seemingly every conceivable direction. But to the exercised mind, it's a simple matter to climb, twist, and climb some more, to get from any point to any other. Finding your way from the bottom of the stairwell to an exit, something you might not even think to do were you not an avid player of The Bridge, is a fun, practical challenge, rather than a headache-inducing thought experiment. When I finally finished The Bridge and started examining Escher's work again, I realized that this experience had completely altered the way I look at much of his art. I no longer see the impossible structures and wonder how he could even conceive of such a thing. Instead I see a puzzle, and wonder how I might make my way through it. I'll never again see an impossible object and not immediately see a tiny little sketch of a man walking and rotating his way impossibly around it. If you'd like to train your mind, The Bridge is available now on Steam, and you can learn more about it at the official site.